Over the past few days, two of the best shows of the last decade came to a close. 24 and Lost had been viewing staples for me as I was on-board with both shows from day one. I feel both shows were at their best in the middle seasons and both ended up being revolutionary in their unique methods of storytelling. Lost was able to bend narrative with temporal shifts that have never been attempted before on television. 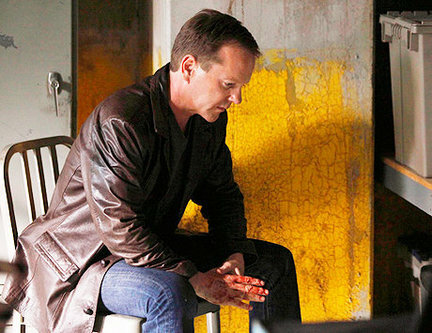 24 turned the gimmick of showing events in real-time into 8 seasons of gripping TV. Both shows will be missed but I have very different opinions of how each show wrapped things up. From the pulse of the internet, it seems as if most people are happy with the ending to Lost. I am not one of them. For a show that had an end-date in sight way back in Season Three, the finale felt like a cop out from a group of writers who actually never had a true idea of how it was all supposed to end. While I did enjoy certain aspects of the finale (meeting after death, wrapping up some of the relationships), I feel that there wasn't much thought put into the conclusion. For me, the Dharma Initiative and some of the other sci fi elements were the main drawing factor of Lost. In the past two seasons, Lost has switched from being a show rooted in science fiction to a more spiritual show. I feel that key science-based questions we had all along were never answered and towards the end of the series, the writers decided to throw the Jacob vs. Man in Black (good v. evil) arc at us and force us to think about things on a more spiritual level. At that point I lost most of my interest in the main characters as it seemed the writers wanted us to care about Fake Locke and his eventual clash with Jacob's replacement. We did eventually get that final battle between Jack and Fake Locke but it wasn't very powerful or convincing. Then, on the final episode of the series we get Desmond unplugging some magical light pool followed by Jack plugging it back in again. Seriously... what the hell was that all about? For me, I just feel that the writers thought they had an end game all planned out but at some point in Season 5 or 6 they just abandoned it and started over with a mediocre resolution in sight. I invested a lot of time in this show and just don't feel that the end was the payoff that seemed to be promised to me throughout the previous five seasons. Anyways... Lost will be a landmark show that will be remembered for its originality but I myself am glad to see it go. Unfortunately it suffered from two bad seasons in the end (very similar to the fate of The X-Files). While the creators of Lost had the advantage of knowing the series end date well in advance, the writers over at 24 had to re-write some details mid-season due to the in-season cancellation of the show. Another issue going in to the finale was a real possibility of the production of a 24 movie in a few years. The 24 writers could not completely end things (meaning kill Jack Bauer) because of the events that may or may not unfold on the big screen. That being said, I think the writers did an admirable job of wrapping things up. The biggest star of the 24 finale was Cherry Jones (President Allison Taylor) who finally stepped up to the level of performance that earned her the Emmy for her role in Season 7. I thought the presidential plot line was a little weak throughout Season 8 but Jones gave a very powerful performance as she played against Mrs. Hassan in some heated last-minute scenes. The suicide of President Logan served as the most shocking moment of the finale and the Jack vs. Chloe confrontation was well scripted. While the actual end of the show was a little weak (really? ending this thing with a camera shot from an unmanned drone? ), the emotional connection between Chloe and Jack was conveyed very convincingly. In the end it did come down to their friendship that lasted through all 8 seasons. Unfortunately we have to say goodbye to one of the most dynamic characters in television history (Jack Bauer). Keifer had a great run as Jack and I hope to see him play the role at least one more time. I do think that 24 could translate well to a motion picture format if the story is crafted properly. Kudos to 24 though for actually picking a plausible ending for the series that was well written and acted. Opinions? Theories? Disagreements? Bring them on. At least my television viewing schedule has freed up big time. Just in time for summer.